Geoff Esposito, a familiar face at the Capitol, has a new role. 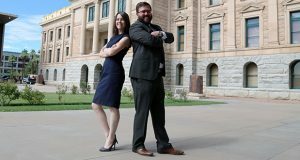 As a lobbyist for Creosote Partners, the Chandler native has long been active in local Arizona politics, dating back to his high school years and stints at the Arizona School Boards Association and Expect More Arizona. A founding director at lobbying firm Veridus LLC and one of the most respected in her profession, Wendy Briggs has built a reputation as relentless, tireless, dependable and tough as nails – qualities that have served her clients well. A House panel has passed a measure that would clarify what lawmakers have to report as gifts for travel-related expenses. The Capitol Times’ annual Book of Lobbyists publication is now attorney Tom Ryan’s latest evidence that Bitter Smith has conflicts of interest and should be removed from the Corp Comm.